It swayed with the rhythm of her steps as she danced with a number of partners but kept coming back to her "special" Juano. I was exhausted just watching. However, I did notice that her dress stood up to the rigors quite magnificently, and cutquite a figure. Antonella's Sweater Dress (No. 3328). Great V-neck slip over in 100% extra fine merino wool. Rib and pointelle details around front neck. Tubular finish on sleeves. Sophisticated double hem action. Don't forget the belt. Women's sizes: XS, S, M, L, XL. She did confess at Bar Británico, a late night spot (or early morning), that while she found it in Buenos Aires, it did come from Italy. I didn't hold it against her, since I had observed how it looked against her. 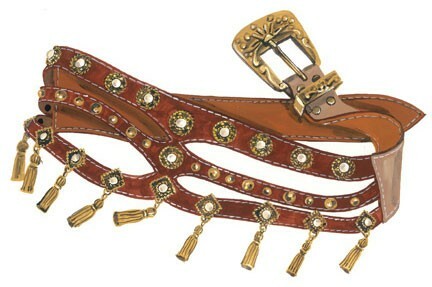 Antonella's Charm Belt (No. 3533). Handmade in the U.S. from the Argentinian leather "original." Antique brass embellishments sway when you move. White contrasting pick stitching. Buckle in the back looks like the front of most belts. They won't know whether you're coming or going. But they will know you've been there. 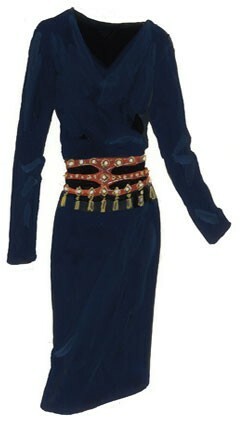 The Belt Women's sizes: XS, S, M, L, XL. Color: Rich chestnut with antique brass and off-white embellishments, alongwith antique brass charms that dangle from the belt. USA. This is a simply stunning combination if you are lucky enough to have the figure. Make that statement.